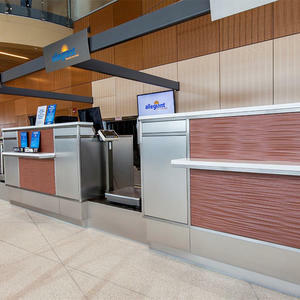 Duluth International Airport’s new $78 million passenger terminal is a 101,000 sq. ft., LEED Silver certified facility with a unique design vision tied to the natural beauty of Northern Minnesota. The building, designed by Reynolds, Smith, and Hills, Inc. (RS&H) in collaboration with TKDA, took four years to complete and was erected in front of the old terminal, which no longer met federal aviation requirements and was ultimately torn down. The new terminal covers the Northern Territory of Minnesota, and houses four gates and three airlines. Due to its relatively small size, the architects and designers involved with this project decided to go with a boutique concept. The facility has towering windows throughout, letting passengers view the rugged beauty outside. The design intent for the terminal was to capture that natural beauty indoors as well, but in a subtle way. 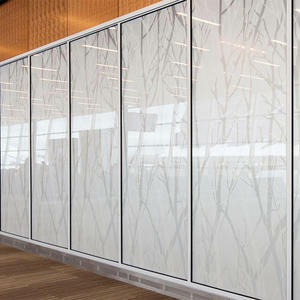 One subtle way she brought the outdoors in was through a 52-foot-long feature wall of Forms+Surfaces’ ViviGraphix Graphica glass with a custom pattern featuring the silhouettes of native Birch trees. Samsa considers this to be the main focal point of the concourse. ViviGraphix Graphica architectural glass features precise patterns consisting of one or more color graphic interlayers laminated between two lites of glass. In this case, Samsa chose the image of the trees, which we used to create a graphic made up of multiple interlayers. The result is glass that looks three-dimensional and makes the Birch trees look like a forest with depth. The feature wall separates the concourse from the TSA checkpoint, which means it had to meet the TSA’s strict security standards while also meeting design requirements. Custom gradation ensured the glass was nearly opaque at the bottom and became more transparent towards the ceiling. In addition to the ViviGraphix Graphica glass wall, TKDA also specified Forms+Surfaces Bonded Metal panels to cover the front façade in the check-in area and the ticket counters in the concourse. Bonded Metal is the product of a unique technology that casts metal granules in a tough, fiber-reinforced polymer matrix. The result is lightweight but extremely durable castings with the character and appearance of solid metal. 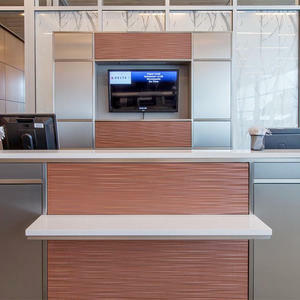 The Bonded Metal was made in a custom color, again reflecting the warm color palette used throughout the facility. It also allowed the designers to bring another element of the outdoors in – water. 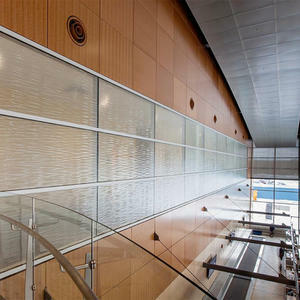 “Throughout the airport, we incorporated rolling or rippling designs, using forms and patterns reminiscent of the ripples on nearby Lake Superior. This is a port area, and the lake and the shipping industry is very important to this region,” said Samsa. Mara, one of 17 standard patterns we offer for Bonded Metal, is used here as a horizontal pattern of uneven lines marking gentle swells, like the ripples on a pond. 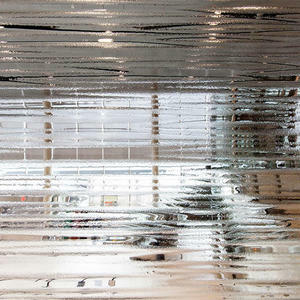 This same theme can be seen in an undulating, reflective ceiling that spans the terminal. 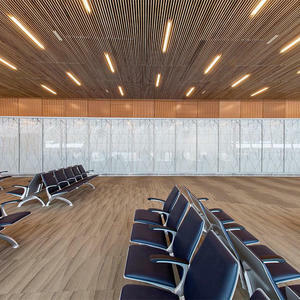 Lastly, Samsa chose ViviForm Impression glass in Kalahari pattern for a long corridor above the check-in area. This glass pattern also reflects the water element, although in a different form. 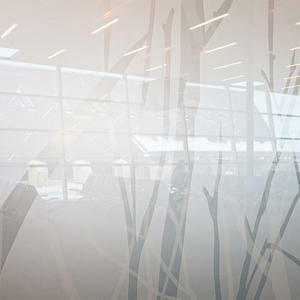 ViviForm Impression glass allows diffused light to shine through while obscuring the view behind it. 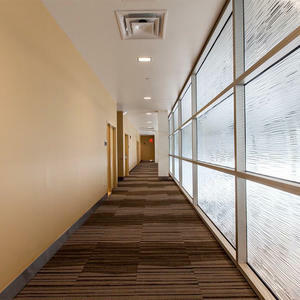 Comprised of a single lite of slump glass, ViviForm Impression offers a level of privacy usually associated with opaque materials. Reaction to the new airport has been overwhelmingly positive. 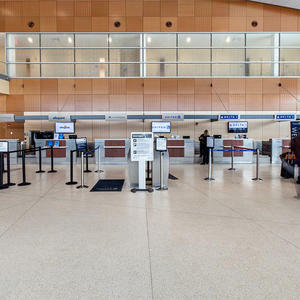 Samsa envisioned a terminal that was warm, inviting and regionally appropriate, and it’s clear that she’s exceeded those goals at Duluth International. Approximately 4,000 people waited in line and braved snow and icy conditions to attend the terminal’s 4-hour Open House event this past January, and people were delighted with the bright, open and airy new facility. 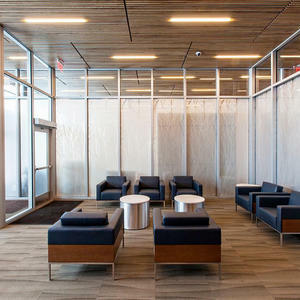 Beyond their aesthetic value, Forms+Surfaces’ products are smartly engineered of durable, high-performance materials that meet the demands of high traffic spaces of all kinds, including airports. Forms+Surfaces is delighted to have been involved in this project where the natural beauty of the region was so seamlessly integrated into the new terminal. For more information on the products we’ve mentioned here or any of our other product lines, visit www.forms-surfaces.com.